A family who can give Larry & Ja’Cary the attention, acceptance and affection that they need. A family who can teach the boys at their levels, in spite of their delays. A family who has experience with developmental delays and autism or one who is willing to learn. A family who enjoys seeing their children learn and celebrates their victories. A family who believes in keeping the special sibling bond that these two have. 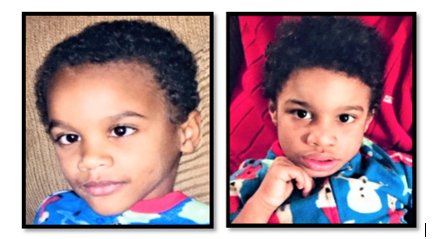 A family who wants to provide legal permanency by adoption for Larry and Ja’Cary. If you would like to add this sibling group to your family to provide them with a permanent loving home, please contact your resource worker to submit your home study to Karen Tesyk or call 330-941-8888.